« Regarding National Council for Promotion of Urdu Language (NCPUL). I had written to you a letter regarding the establishment of Urdu department in CUH. As we are aware that Himachal Pradesh has very strong reason to promote Urdu because this state was founded on the ground of Urdu language and until some years ago Urdu was taught in all schools of Himachal also. We are also aware that Urdu is a language of peace and harmony and the great heritage of India. Its role in our freedom struggle is well known, and as a language Urdu regularly promotes cultural and communal harmony. Urdu is not only a language of India and that of Pakistan but also a lingua franca of South Asian Countries. 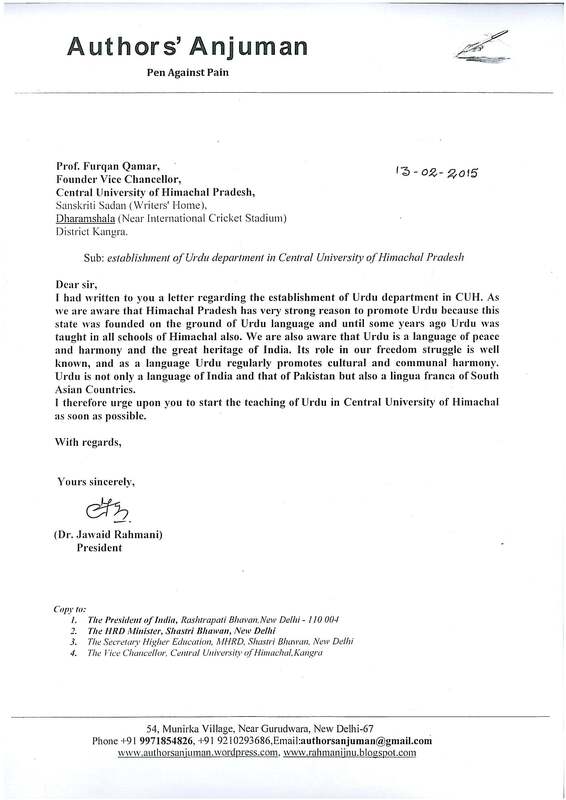 I therefore urge upon you to start the teaching of Urdu in Central University of Himachal as soon as possible. This entry was posted on February 17, 2015 at 6:10 pm and is filed under Uncategorized. You can follow any responses to this entry through the RSS 2.0 feed. You can leave a response, or trackback from your own site.